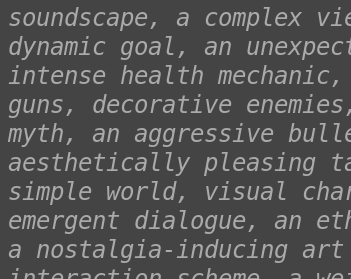 This is a small sentence generator that tries to formulate “game ideas.” It’s mostly incoherent, but might sometimes cause a spark of inspiration. Made for PROCJAM 2018. This game is distributed under the MIT license. The license text and source code can be found in the project's git repository. > First-person puzzle with an avant-garde goal, and intense camera-animations.